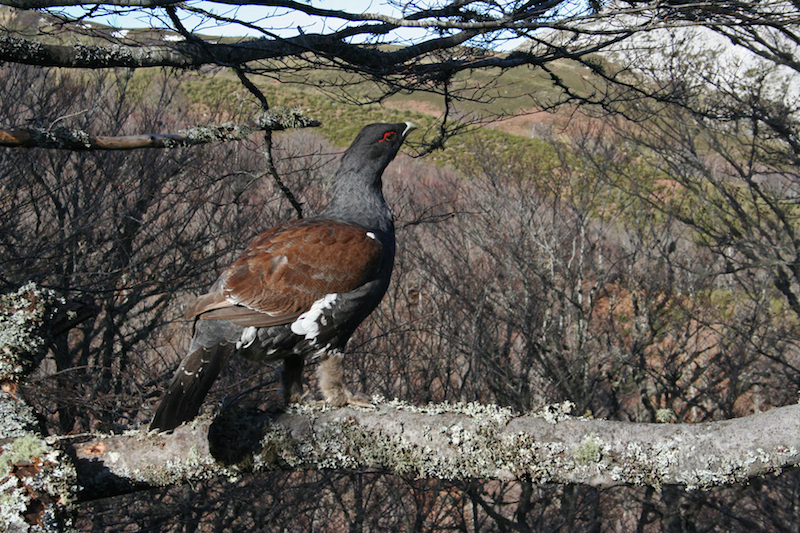 The LIFE+ Cantabrian Capercaillie Project has been six years of work, in which state and regional authorities, civil society and the business sector have set up coordinated urgent action to improve the conservation this subspecies native to the Cantabrian Mountains for the first time ever. These are the 10 main results of the project coordinated by Fundación Biodiversidad from the Spanish Ministry of Agriculture, Fishing, Food and Environment. The LIFE+ Cantabrian Capercaillie Project has allows us to lay the foundations for the future of the species, based on the experience and scientific and technical knowledge gained. Over the course of the project we have drawn up technical documents for the conservation and improvement of its habitat, the situation with competition and predators, population strengthening, genetic classification of the Cantabrian capercaillie population and land custody. Furthermore, we have requested assessment reports from universities and scientific institutions regarding the development and monitoring of the actions to manage its habitat, control predators and collect eggs from the wild. Regarding forest management, we have carried out selective forestry treatments on more than 500 hectares to favour the development of key species for the capercaillie and achieved forest areas with a better variety of structures in which there are open spaces, clear, spaces, pastures, woodland and shrubbery. One of the critical factors taken into consideration when planning the work to improve the habitat was the capercaillie’s great sensitivity to interferences from human action. The project has allowed us to know how it is responding the planned actions. Through the work carried out in Alto Sil and Omaña we have found hatched eggs and specimen. Fences used in farming can be a cause of death for the capercaillie because they can collide with it on days with low visibility. To avoid this threat, we have removed or marked 60km of dangerous fencing as part of the LIFE+ Cantabrian Capercaillie project. Furthermore, the electrical infrastructure can be a nuisance and even a cause of death for the capercaillie and other bird species in the mountain range. Therefore, we have acted to reduce the risk of electrocution and the noise impact of the substation located in Puerto de Panderruedas (León). We have also marked three kilometres of the electricity lines that go down from Puerto del Pontón towards the Sella river. The aim of these actions is for there to be a long-term favourable environment for the capercaillie in which it can recover and return to the areas that it had inhabited. The large amount of deer affects the quality of the bilberry and holly shrubs and means that there is less food available and changed the structure of supportive habitat that would protect the bird from predators. As part of the project, we have been monitoring the deer population and it is under control in Cantabria, the Picos de Europa National Park, Castile and León and Asturias. Alongside this, we have evidence of its effect on the bilberry through fenced-off control areas in the Picos de Europa park. Furthermore, we have also controlled predators in the specimen release areas and where the species often tends to return in order to boost the reproduction rate. Among other things, we have captured and relocated pine marten in Cantabria and around the release park in the Picos de Europa park and Castile and León. The dire situation in which the Cantabrian capercaillie finds itself makes it difficult for it to recover just from the naturally occurring population centres. Spain, much like other countries such as Poland, has opted for breeding in captivity as an additional measure to boost the wild population. The captive breeding programme has seen its first offspring and now has 23 specimen. The Cantabrian capercaillie breeding and genetic reserve centre has 22 at its facilities and there is another specimen in the wildlife recovery centre in Cantabria. Over these early years, data of interest has been collated regarding the species, reproduction, behaviour, feeding and health-related aspects. The LIFE+ Cantabrian Capercaillie Project has a programme for strengthening the capercaillie population with specimen bred in captivity, based on the guidelines from the Conservation Strategy for the Cantabrian Capercaillie in Spain. The first release of specimen took place in Picos de Europa SPA in Castile and León. Three females from the breeding centre were reintroduced into the wild and were able to feed self-sufficiently for at least two months. Apart from this experience, we have also directly released two females into the lek in the Alto Sil SPA, as a way of increasing the possibility of them mating in the right season. Despite the fact that four of the five females eventually died and the other one lost signal, the data obtained has provided information about the adaptation of the specimen to their new environment, their movement and their use of one habitat compared to others. The programme for capturing, tagging and collecting eggs allows us to monitor the specimen that have been captured and tagged with transmitters to locate them and, where possible, collect eggs to bring them back to the breeding and genetic reserve centre in Sobrescobio. Since the LIFE+ Cantabrian Capercaillie Project was implemented, there has been one partial collection of eggs and 13 specimen have been tagged. Thanks to this programme, we have collected relevant data about ecology and the distribution of the species. Land stewardship is a tool that has built networks between land owners, non-profit organisations and the local residents to improve the Cantabrian capercaillie’s habitat and work towards its recovery. 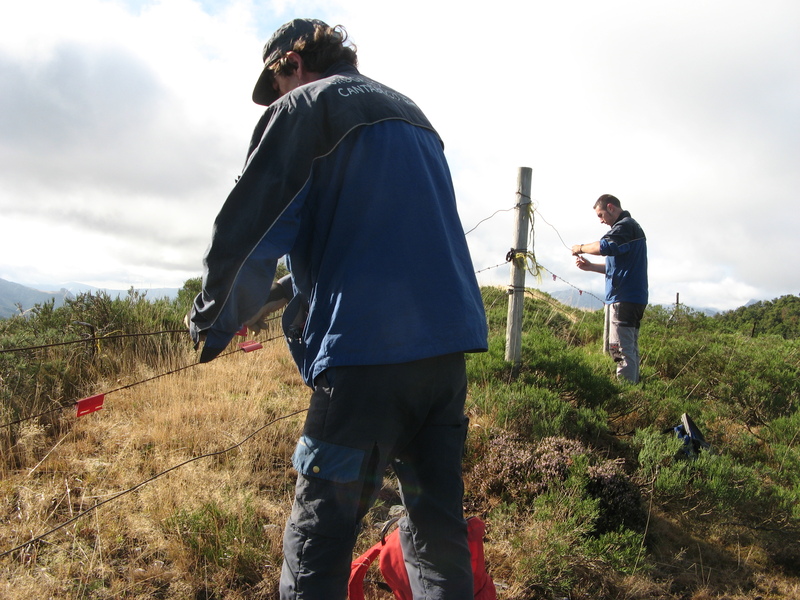 The land stewardship programme in the LIFE+ Cantabrian capercaillie project has managed to bring together Neighbourhood Associations, forest wardens, beekeepers, livestock farmers, hunters, young entrepreneurs, NGOs and rural people. All of their efforts have helped create 19 projects through 29 collaboration agreements. These initiatives have contributed towards improving the environment, create jobs and boost social involvement and traditional activities in the Cantabrian Mountains. Furthermore, we have also created forestry and pasture planning instruments to promote traditional activities. 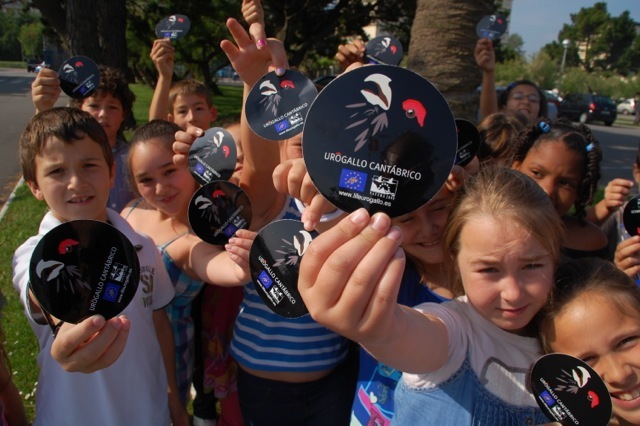 The LIFE+ Cantabrian Capercaillie Project has contributed towards improving knowledge about the species and has promoted respect and protection of the Cantabrian capercaillie among future generations. More than 2,000 school children have taken part in the project’s educational campaign. Furthermore, there has been a volunteering campaign in which 72 volunteers were involved. We have also published outreach material, including information panel located in each of the SPAs, informative manuals, a documentary, videos, a story and an instructional unit, among other things. Furthermore, the travelling exhibition has had over 120,000 visits in the 50 towns and villages it has travelled through. We have also given informational talks for hunters, livestock farmers and the tourist industry and local residents in towns and villages throughout the Cantabrian mountains. The project has also given a certain importance to communication and outreach action. The LIFE+ Cantabrian capercaillie webpage has information about the project, outreach material and technical documents for reference. When implementing the project we have taken into consideration the experience gained in other regions and countries to promote information exchange regarding the management of the capercaillie’s habitat and captive breeding. The LIFE+ Cantabrian capercaillie team has taken part in international technical meetings and has welcomed experts from other regions. Specifically, we have exchanged experiences with Scotland, Poland, France and the Pyrenees. The project has created local work, both directly and indirectly. Specifically, 20 jobs have been created and over a hundred people have been involved in the project over the six years of implementation. Everyone’s involvement has meant that the LIFE+ Cantabrian capercaillie project has been able to be well implemented, despite taking place during the severe financial crisis in Spain. The project was coordinated by the Biodiversity Foundation of the Spanish Ministry of Agriculture, Fishing, Food and Environment and is 50% co-financed by the European Union, through the LIFE+ funds. Other partners are the regions of Cantabria, Asturias and Castile and León, the latter through the Fundación Patrimonio Natural de Castilla y León; Consorcio Interautonómico para la Gestión Coordinada del Parque Nacional de los Picos de Europa; SEO/Birdlife, Tragsa and Tragsatec, with co-financing from the Organismo Autónomo Parques Nacionales and Fundación Iberdrola España.